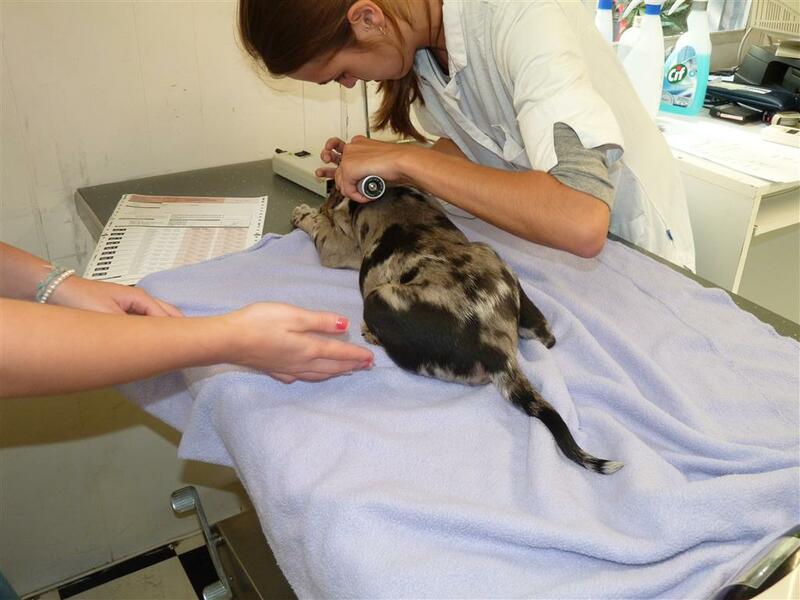 The Brainstem Auditory Evoked Response (BAER) test is the only proper method of diagnosis. Bilateral hearing passes the test. Unilateral or bilateral deafness fails. First the ear canal and the eardrum being thoroughly inspected with an otoscope to rule out that any deafness is caused by a very dirty and / or inflamed ear canal or a broken eardrum. earpiece where the sound stimulus is passed into the external auditory canal applied. In the middle are the sensory cells that convert sound into electrical potentials. 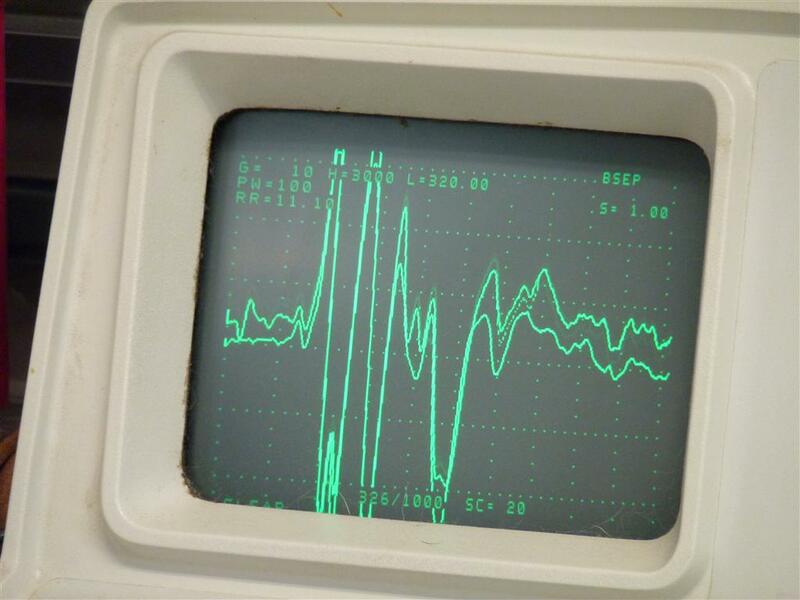 These electrical potentials are measured during the BEAR test. higher centers in the brains formed. dogs, can carry the Merle gene. This is called Cryptic Merle, Mcm. The Merle gene (M) is dominant so that affected dogs (Mm or Mcm) can be deaf. 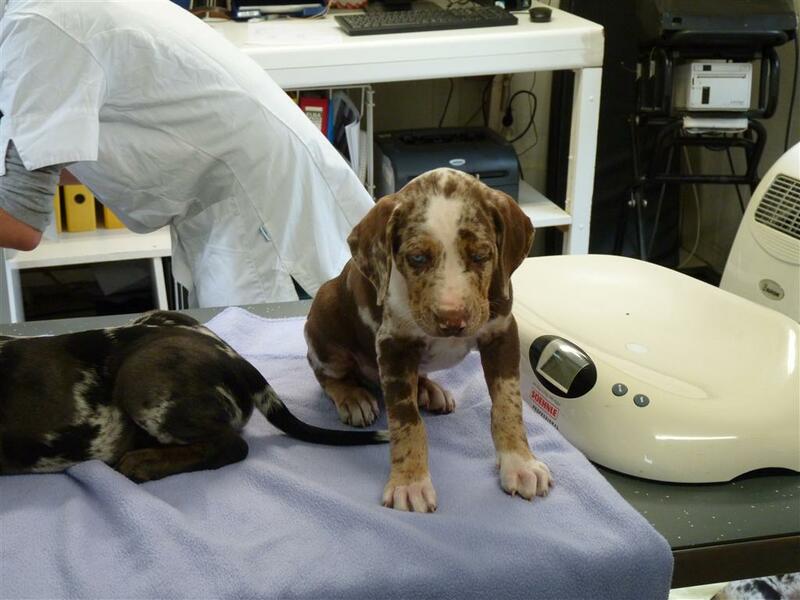 However, when two dogs with Merle gene are bred, 25% will end up with the MM genotype. These dogs often have a solid white coat with patches and blue irises, are often deaf and/or blind, and can be sterile. So it is a higher risk to breed two Merle looking dogs. 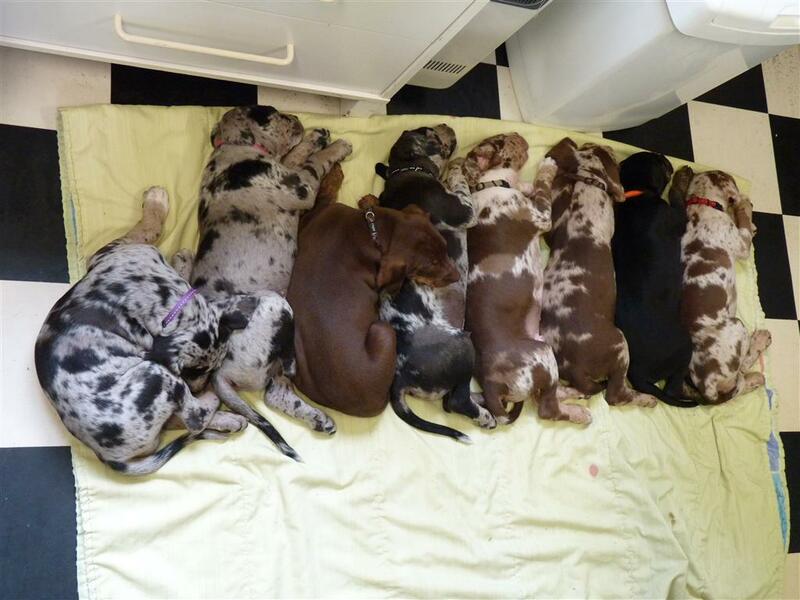 Breeders of these dogs know it is a risk to breed Merle to Merle. 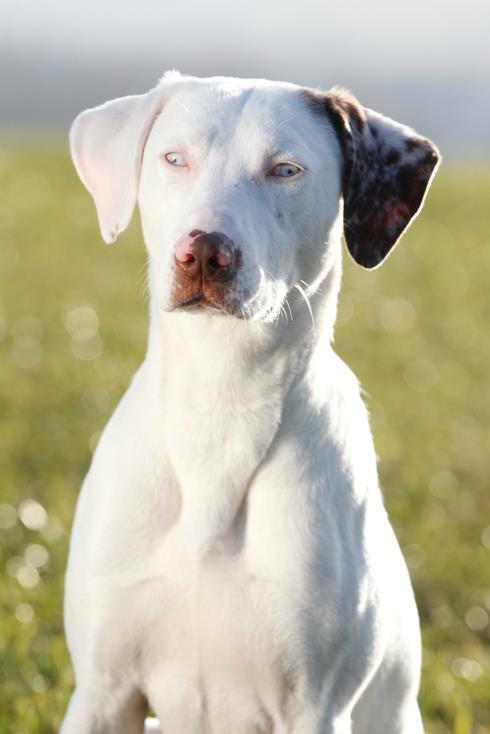 In this case the deafness is neither dominant nor recessive, but is linked to a dominant gene that disrupts pigmentation and secondarily produces deaf dogs. important to test all pups/ dogs who are a suspicious. 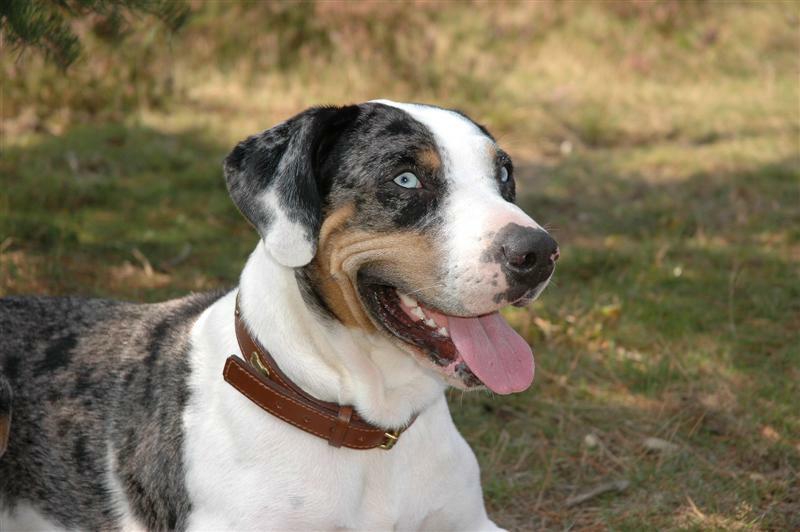 Because a Catahoula can carry a MM, double merle gene, which sometimes is not show on the outside, it is better to avoid breeding Merle looking x Merle looking. Below you see different an example a of unilateral and bilateral dog. 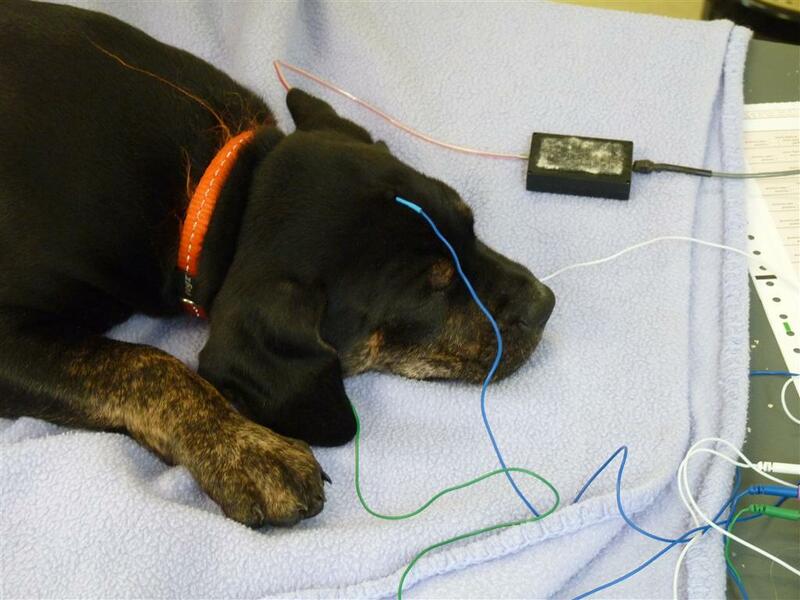 Being BAER tested with sedation. Checking the ears if they are clean. Hearing, when deaf it would be a staight line. Slowly waking up after the test.